I was sitting at one of my favorite Tiki Bars, called the Sunset Grill, at Little Harbor last week. It was late afternoon and my wife and I were relaxing over a glass of wine and trying to decide whether to eat there or go home and cook up something later. 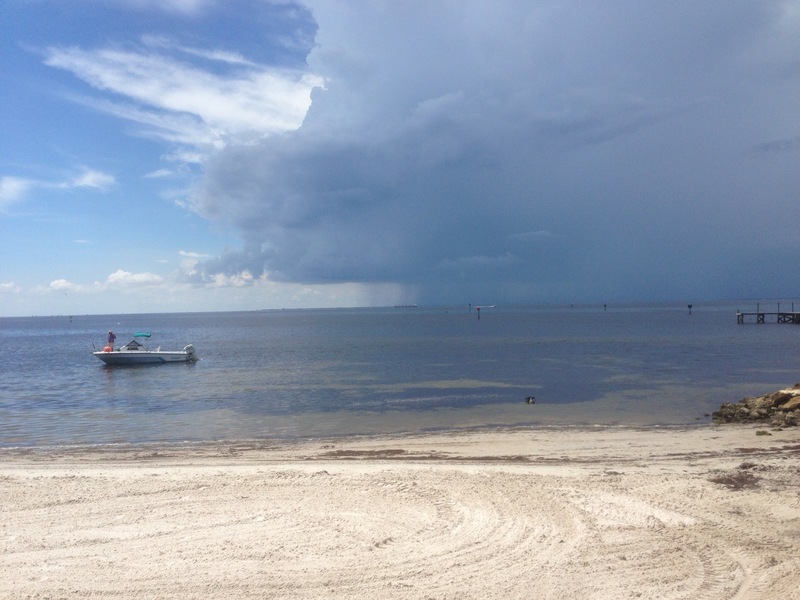 Then, I noticed this storm crossing the Bay from St. Pete, heading towards us on the mainland. I grabbed my trusty iPhone and grabbed the shot while I could. By the way, the guy in the boat had been sitting at the bar when we arrived and actually lived over in St. Pete. He had told us (and everyone else) that he kept the boat just for visiting his favorite watering holes around the Bay, on pretty days. At first he was just sitting there, sipping on the beer special of the day when he suddenly stood up and said, to no one in particular, that he was going to race the storm to his home. The waitress obviously knew him and warned him to wait the storm out. She even offered to give him another beer, free. But, he just smiled, finished his beer and waded out to his boat. I had a great time, later that night, sitting on my Lanai, bringing up memories of old stories, old books and old movies in my head. Stories where the brave sailor was in his little boat battling the raging seas. Of course, the storm you see in the picture was just a typical South Florida afternoon squall. They come and go so often in the afternoons this time of year that you learn to ignore them. As to my sailor friend? I guess he made it, OK, because there was nothing on the news about drunken sailors lost at sea. Life is often just more interesting at Tiki Bars with great Sunsets and unique people grabbing your attention. It beats the Hell out of TV’s and such! Previous PostPrevious It’s Hard to Kiss the Lips …… A Country Music Classic!